John has been a professional Holistic Healthcare Practitioner since qualifying in 1983. He is a registered Consultant, Teacher and Practitioner with the Scenar Practitioners Society of Ireland (RSPSI-C) having studied in Russia, the UK, Switzerland, The Netherlands and Bulgaria; and a registered teacher with the Shiatsu Society of Ireland (RPSSI-T). He is a graduate of the Russian School of Scenar and Scenar Training Centre (UK). John is a qualified Trainer through the National University of Ireland (NUI) Maynooth, Training in Continuing Education programme. John uses safe and non-evasive diagnostic tools, such as Computerized Infrared Thermal Imaging (CITI) and Rista – Nakatani in order to provide full body or partially specialised examinations as well as using Shiatsu and Scenar Therapy to treat ailments. In our healthcare centre many ailments of a physical, emotional, nervous or mental nature can be treated by the aid of Shiatsu bodywork, Scenar therapy, nutrition adjustments and/or lifestyle counselling. Depending on the individual problem or ailment, John, or a trained and qualified Scenar therapist under his supervision may diagnose by taking a health history, examining diet and lifestyle, observing posture, skin colour and tone, eyes, pulses, foot reflexes, abdomen and back, taking blood pressure or using various bio-feedback units. 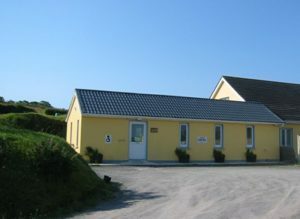 The Holistic Healthcare Centre is located in the countryside near Leap in West Cork. The information offered on this website is meant to be combined with one-to-one consultations with the therapists at the John Garvey Holistic Healthcare Centre. Visitors to the website are advised that the use of remedies can be harmful if taken incorrectly and consultation with a doctor should be made. Staff are not responsible for the inappropriate, inaccurate or ineffective use or misuse of remedies supplied by the centre. Every effort has been made to ensure that the information supplied on this website is accurate and up to date but cannot be held responsible for misprints, errors or other inaccuracies. Client information received through feedback from this website is strictly for the use of the John Garvey Holistic Healthcare Centre only and will not be passed to any third party companies. At all times we strongly value client confidentiality. The centre is not responsible for any financial or personal loss incurred as a result of visiting this website. This website is for reference material only and is designed to be used in conjunction with a personal consultation at the centre. It is not to be used as a substitute for a medical consultation.